Last seen wearing: Blue baseball cap, blue shirt, gray shorts, gray tennis shoes. Munoz was last seen at his residence on 7/25/2018 by his caretaker. He suffers from Schizophrenia, is bipolar and takes daily medication for them. Munoz has not taken his medication since the day he went missing. He is known to frequent the 7-11 on Fairhaven and Grand Ave in Santa Ana. 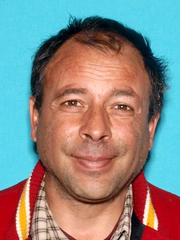 Munoz has been reported missing in the past and has a history of frequenting the following areas: Garden Grove Blvd and Euclid St (near commercial storefronts), Hart Park (city of Orange) and the Ralphs grocery store on Main Street and Chapman Avenue (Orange). Munoz has a speech impediment and walks with a slight limp. He is not known to be aggressive and does not have a cell phone on him. He has the ability to communicate his name and date of birth but not his home address. His primary mode of transportation is on foot. Those with additional information are asked to contact Detective Andy Garcia at (714) 245-8408 or email agarcia3@santa-ana.org.